A midnight-blue, two-door hardtop Chevy Impala with 42,000 actual miles on the odometer would tip the value scale today at several thousand dollars. But in 1973, the price tag was $450.00. This, the second automobile I ever owned was certainly a keeper. But no one told me that. Even if they had, I probably wouldn’t have listened. I was only seventeen! It was stock. 283 cu. in. (220 hp) with an automatic transmission. Very little rust, no rattles, no dents, near perfection. I’m sure I have forgotten the little finish flaws. Now that I think about it, I remember spending New Years’ Eve 1973 painting the car with a friend in a borrowed paint bay of a local body shop. It was a midnight re-application of the original color, midnight-blue, a color eerily similar to my 1974 Firebird, my 1987 Grand Marquis, and my 2002 Camaro Z28. Thinking further… the original wheels must not have been perfection to my taste either. I changed out the plain stock steel wheels & full wheel covers for the magnesium “bullet” style wheels pictured. I’m not quite remembering where I got those beauties, but they are undoubtedly the all-time number one WellsWooster favorite wheels over the last 35 years. No engine modifications ever. The only mechanical problem I remember having with the Impala was a broken motor mount. Oh, I guess I did have to replace the exhaust system, an idler arm, brakes… all normal stuff on any ’60s Detroit metal. Except the motor mount. I really thought that was unusual. It first manifested itself on sunny autumn afternoon during a full throttle left turn from a stop. Strange feeling, that motor rising. Since it was a small block ’65 Chevy, it wasn’t a complicated or expensive repair. A year or so later, I gave the Impala up in an even trade for a ’66 Chevelle 300 Deluxe two-door sedan. That monster had a bored-out small block Corvette 327 c.i. engine (390 hp), 350 Turbo automatic transmission, Hurst shifter, Malibu wood grain interior components, Super Sport hood and Malibu external badges. All that with the high gear ratio rear-end (from it’s stock 6 cylinder origin) made it the most unique vehicle around at the time. But if I were able to get back either car in a time machine today, and could only choose one, it’d definitely be the Impala. That’s the lesson, son and daughters. This entry was posted in Cars and tagged Classic, Impala. About the photo. I developed and printed this (5X7) myself in a high school photography lab. The scratches are not new, they’re original. The scratches are not planned either, but heck, it was only the second photographic print I made in my life. Give me a break. The setting is my (parents) back yard near the Blandford Nature Center in Grand Rapids. 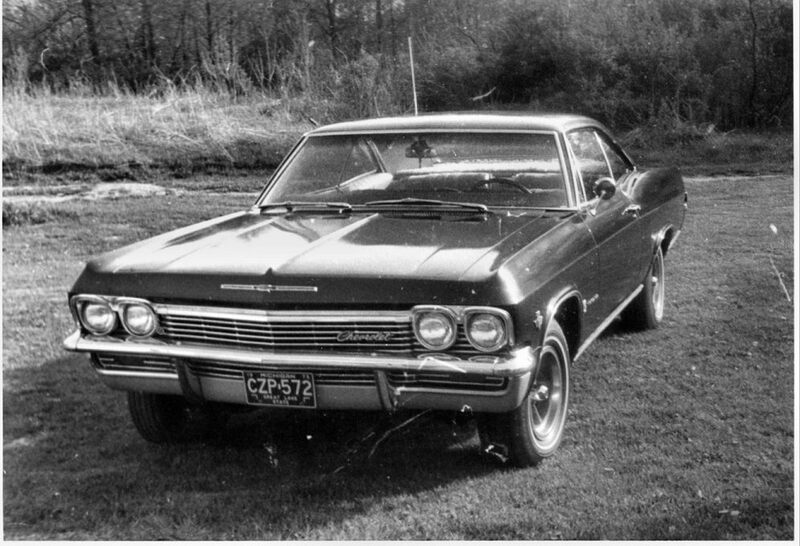 A few years later, my Chevelle would be in the same exact spot, but under way different circumstances – a later post.